Why helloooooo there you creative peapod! If you don't know exactly WHO your ideal client is, then it's time you figured that out! Like today. Like right this very second. Because if you don't even know who you're talking to, then how can you possibly know whether or not they are understanding your brand? How can you create awesome content (both free AND paid) for some one if you don't even know WHO that some one is? So first things first. 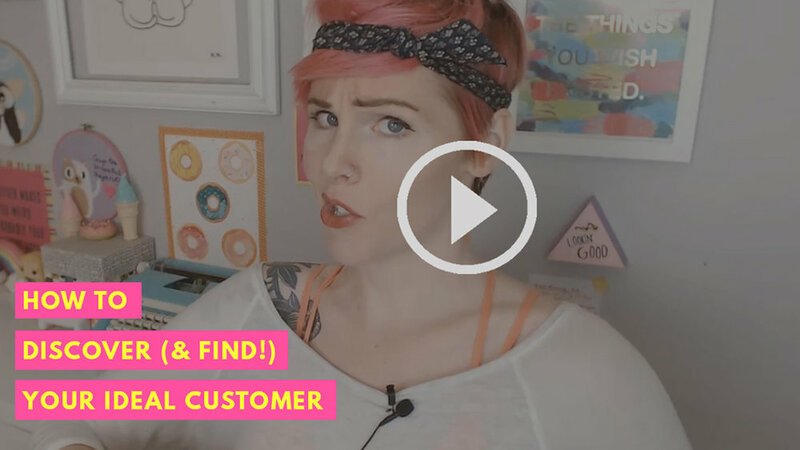 Just watch the short 8 minute video below so that you can learn how to discover (and find) your dream customer in just a few easy steps! Go on, watch the short video right here. Discover & Find your ideal customer here! And now that you know exactly WHO they are, let's talk about 5 more things you can do to attract your ideal clients! 1. GO LOOK IN THE MIRROR. There's a pretty decent chance that many of your ideal clients are people just like you. And WHY is that, you might be wondering? Well, I'm willing to bet my last cup of coffee that you create content for your blog or business that actually interests you! After all, spending lots of time creating content that you're not even interested in would be pretty boring and miserable, am I right? So that's why taking a good, hard look in the mirror is a great place to start when trying to profile your ideal client and trying to find your unique niche! What is your dream job, and do you currently have it? What do you love doing for fun? What makes you happy? You're going to be asking these same types of questions about your ideal client in just a second, and I've created some handy worksheets to make it easy! So feel free to gett'em below and fill out 2 copies; one for profiling yourself and one for profiling your ideal client! 2. PROFILE YOUR IDEAL CLIENT. Alright you devilishly stunning person you, it's time to do what we did above with your ideal client now! If you already have an audience, throw them out the window for this exercise because we'll get to them in a second! You want to come up with a very clear picture of who you would IDEALLY like to work with in your online business. Ya know ... in a perfect world. Use your imagination! 3. CREATE A SPIFFY MOOD BOARD. 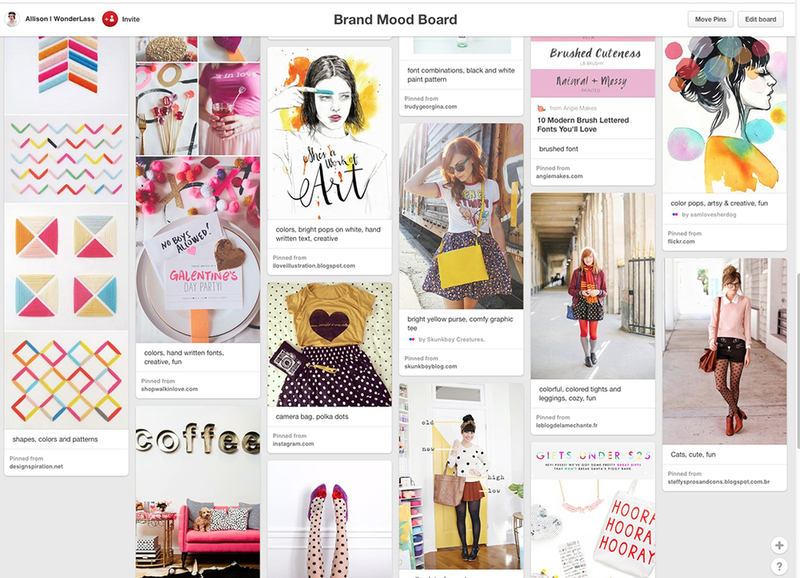 I'm a super visual person, so I love things like mood boards! If this sounds like you, then you should create one for your ideal client. 4. PROFILE YOUR ACTUAL FOLLOWERS. Let's not forget to profile your ACTUAL followers, assuming you have some! After all, they probably feel really sad and dejected after getting thrown out the window during that last exercise! You might already have a good idea of your ACTUAL followers simply by the comments you are getting! Ya know ... on things like blog posts, social media posts and in emails, etc. However, creating a survey is also a super handy way to gather information! There are several ways to do a survey. So consider WHAT you are trying to accomplish before deciding which questions to ask. Mmmkay? Good. When I did this for the first time at the beginning of this year, I was shocked to learn that over half of my blog readers at the time were male! (Thanks, guys!) I was shocked because I wanted to cater to fun, quirky creativepreneurs- primarily women. But knowing this information helped in telling me that I wasn't really creating content with my ideal client in mind. If you find that your current followers are vastly different from your ideal followers (like I did!) then this might be an opportunity for you to change some things! Dive into the things that your ideal clients will go bonkers over. Make sure your topics are in line with what they'd love! Yes, you might lose some followers during the shift, but that's okay because you will gain more followers that are in line with your goals and passions! Like ... I will give you a magical unicorn if you share this post. There, don't you feel better now?! It's so much easier to focus when you know EXACTLY who you want to talk to right?! What about you, whose your ideal client?